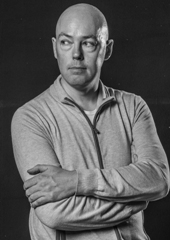 John Boyne was born in 1971 in Dublin. He studied English literature in Dublin and Creative Writing in Norwich. He has published fourteen novels and a collection of short storie and his work has been translated into 48 languages. Boyne made his debut as a novelist in 2000 with »The Thief of Time«, the story of Matthieu Zela, who suddenly stops growing older. Encompassing a life that begins in the mid-18th century to the end of the 20th century, Boyne interweaves historical developments with the life of his fictional character to create a vivid, long-range narrative. Boyne’s best-known work to date is »The Boy in the Striped Pajamas« (2006), an account of the Holocaust as seen from a child’s point of view. We experience the atrocities of National Socialism through the eyes of Bruno, an innocent nine-year-old. Boyne’s fairytale-like and tragic novel serves as a kind a fable that leaves readers enthralled and unsettled. More than seven million copies of »The Boy in the Striped Pajamas« have been sold worldwide. It received two Irish Book Awards and was also nominated for the Deutscher Jugendliteraturpreis; the 2008 film adaptation was shown in cinemas around the world. Boyne’s remarkable variety in content and style characterizes his novels. He writes original stories with masterful dynamic tension and multifaceted characters. His subtle texts captivate the reader with their literary skill. His books for young readers, including »Noah Barleywater Runs Away« (2010), demonstrate a playfulness and sense of the bizarre often lacking in contemporary literature for this age group. Recently translated into German, Boyne’s children’s book »Stay Where You Are and Then Leave« (2013), set in post-First World War Britain, is about a boy on a quest to find his father, who is believed to be missing in action, but who has, in fact, ended up in a home for shell-shocked veterans. The novel received the 2015 Gustav Heinemann Peace Prize for Children’s and Young Adult Literature and was short-listed for the Little Rebels Children’s Book Award. John Boyne’s latest novels are »A History of Loneliness« (2014) and »The Boy at the Top of the Mountain« (2015), the story of an orphan in Second World War Germany who finds himself living in the Berghof, one of Hitler’s headquarters, and is drawn into a maelstrom of terror and lies. John Boyne lives in Dublin.